Todd Minikus and Babalou 41 Win $130,000 Adequan® Grand Prix CSI 3* at the 2016 Winter Equestrian Festival. 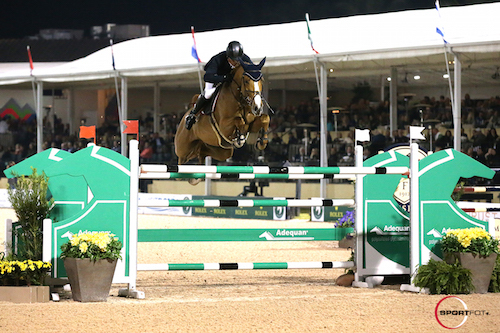 For the second week in a row, USA’s Todd Minikus was the big winner of the Saturday night grand prix at the 2016 Winter Equestrian Festival (WEF). During week two of the winter circuit, held at the Palm Beach International Equestrian Center (PBIEC), Minikus topped the $86,000 Marshall & Sterling Insurance Grand Prix CSI 2* riding Quality Girl. For his win in week three, the rider guided Babalou 41 to a thrilling victory in the $130,000 Adequan® Grand Prix CSI 3*. Laura Kraut (USA) and Nouvelle finished second, and Chloe Reid (USA) and Codarco placed third. Todd Minikus and Babalou 41 in their winning presentation with (left to right) Audrey Bolte, Associate Brand Manager for Luitpold Animal Health, Caroline Hogan, Kathy Serio, Senior Territory Manager for Luitpold Animal Health, Equestrian Sport Productions CEO Mark Bellissimo, Wellington Equestrian Partners principal Katherine Bellissimo, Allyn Mann, Director, Luitpold Animal Health, ringmaster Christian Craig, and Babalou 41’s owner Enrique Cadena. Week three of the Winter Equestrian Festival, sponsored by Adequan®, concludes on Sunday, January 31, with the $35,000 Suncast® 1.50m Championship Jumper Classic. 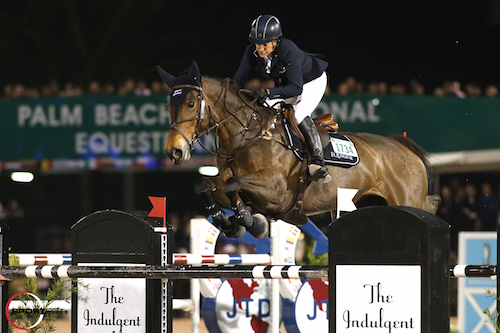 The 12-week WEF circuit runs through April 3 offering more than $9 million in prize money. Luc Musette of Belgium set a challenging track for the 44 competitors in Saturday night’s highlight event under the lights of the International Ring at PBIEC. Seven entries cleared the first round course to advance to the jump-off. Paris Sellon (USA) and Adare were the first pair to tackle the short course, jumping without fault in 44.19 seconds, to eventually finish sixth. Reid and Codarco jumped next, clear in 42.92 seconds, to take third place honors. Scott Keach (AUS) followed with a clear round in 43.18 seconds aboard Southern Cross Equestrian LLC’s Fedor to place fourth. Kraut briefly took the lead with a time of 41.87 seconds riding the Evita Group’s Nouvelle, but settled for second place in the end. Conor Swail (IRL) followed with a time of 44.08 seconds to take the fifth place prize riding Rubens LS La Silla for Vanessa Mannix. Meredith Michaels Beerbaum (GER) and Artemis Equestrian Farm LLC’s Comanche 28 were next, but a drive by at the second to last fence gave the pair four jumping faults and six time faults to finish seventh. Last to go, Minikus and Two Swans Farm’s Babalou 41 blazed through the course for the win in 41.15 seconds. Babalou 41 is an 11-year-old Oldenburg mare (Balou du Rouet x Silvio I) that Minikus has brought along for the last several years. The mare had a fantastic WEF circuit in 2015, including a win in the $150,000 Grand Prix CSIO 4* presented by Lugano Diamonds during week eight’s competition. She also jumped double clean that week to help team USA win the $100,000 Nations Cup, presented by Kingsland Equestrian. The pair went on to compete in the FEI World Cup Finals in Las Vegas in April, and represented team USA in Nations Cup competitions three more times throughout the year in Hickstead, Dublin, and Calgary. When Minikus had a fall in September that caused a severe groin injury, he was forced to take some time off, but noted that the break may have been a benefit to his horses, which have come back fresh and in winning form for the winter. Since he is coming back from an injury and the Olympic Games in Rio are coming up this summer, Minikus is also getting some extra help from trainers Katie and Henri Prudent this winter. Heading into Saturday’s jump-off, Minikus had the advantage of going last, although he did not get to see Kraut’s round, which held the lead. 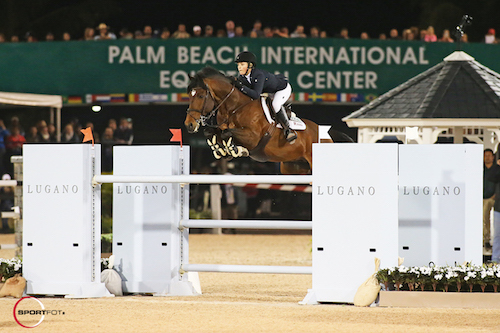 For 19-year-old Chloe Reid, the night’s third place finish was her best yet in a WEF grand prix. Last year she jumped her first Saturday night class and fell off, so this night was an improvement. The riders commented on the course set by Luc Musette, which challenged many of the competitors. 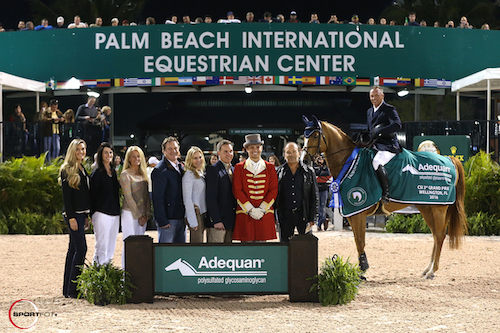 Allyn Mann, Director of Luitpold Animal Health, the makers of Adequan® (Polysulfated Glycosaminoglycan), was on hand for the fantastic competition and praised the riders on a great night of equestrian sport. Source: Lauren Fisher and Callie Seaman for Jennifer Wood Media, Inc. Previous articleRichard Spooner and Mighty Mouse Take $35,000 Douglas Elliman 1.45m Classic. Next articlePius Schwizer came driving the Mercedes-Benz.